Back before I got into this whole craft cocktail scene, there was a bar in Seattle called Vessel, and they were famous for pioneering a lot of molecular mixology techniques, and for the general quality of their drinks and their atmosphere. Sadly, they closed in 2010, and I never got to visit them. They’re back, sort of, and at a new, bigger downtown location. When I heard that they were re-opening, I visited them that same week, but I didn’t get around to posting about it until today. That’s probably my loss, because I missed the buzz, but I think it’s still soon enough to care. To be honest, I was expecting a bit more. No offense to these seasoned veterans, but these drinks are all so safe. I want recipes that push the envelope! I want drinks on the cutting edge of mixology, with flavor combinations and techniques that I’ve never seen before. 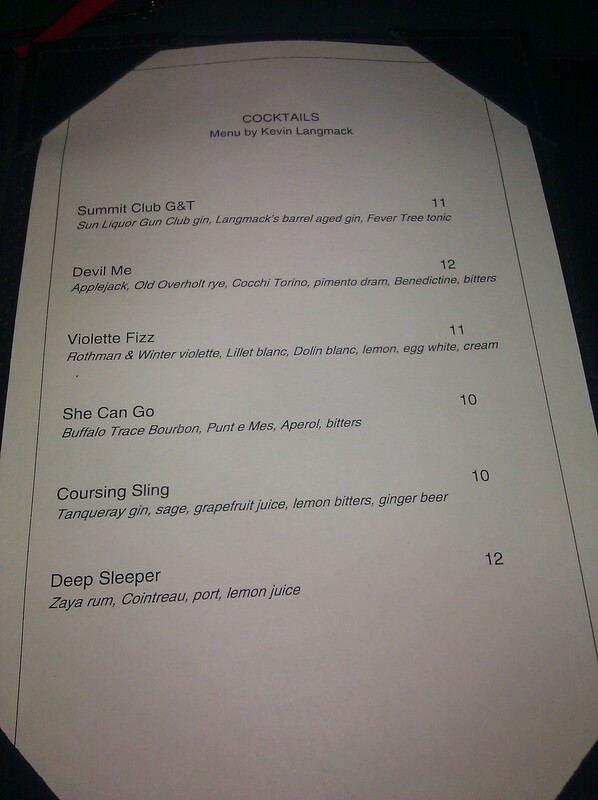 Instead you hit me with a vesper, a gin and tonic, and a sidecar with expensive brandy. This is the kind of menu I expect in an old money hotel, not a bar that was renowned in its heyday for molecular mixology. There’s nothing wrong with any of these recipes, but neither is there anything exciting. 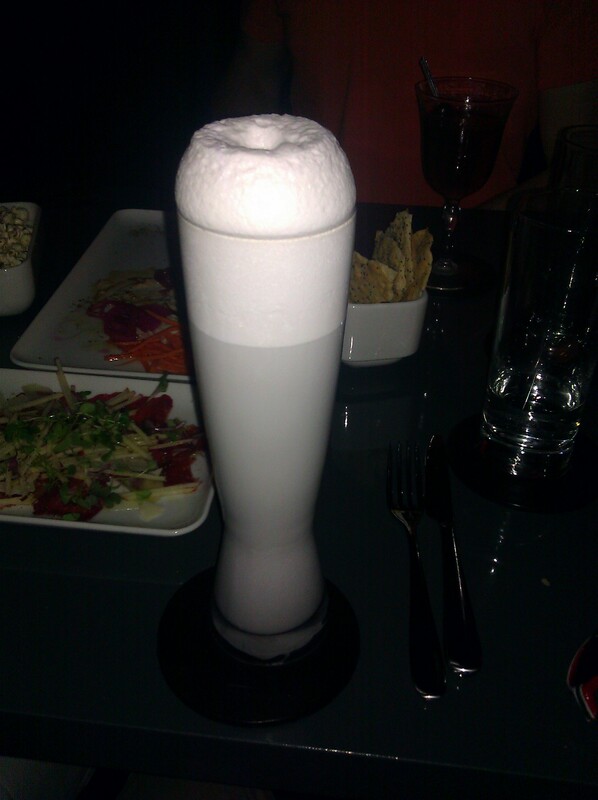 Truly a beautiful fizz, but alas, in a very impractical glass. As I drank it, a portion of the head persisted and ultimately clogged the flow of the drink through the glass when it reached the narrowest part of the glass, forcing me to tilt it to a precarious angle. This is a minor quibble however, as the glass was very elegant. Still, if the radius were constant across the length of the glass, I would have been better served. 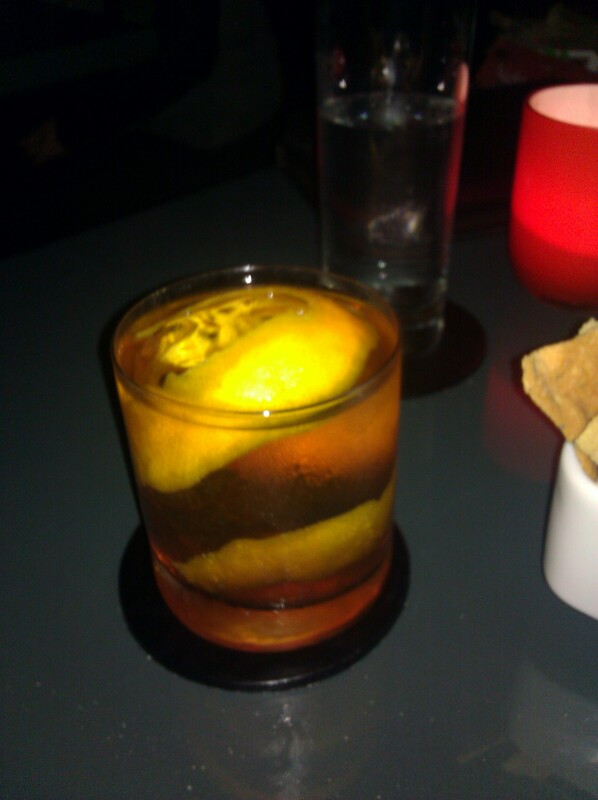 I apologize for the terrible photo, but as you can sort of see, the drink came with a sphere of beautifully clear ice, cut to fit exactly within the glass, and the sphere was circumscribed by a spiral of orange peel for which a whole orange gave its life. James and I both tasted the drink and found the flavor to be very light. It was over-diluted, but it was probably not the bartender’s fault, it was probably the fault of the waitstaff. The service was agonizingly slow, but I was willing to give them some leeway in their opening week. It takes a while to get all the bugs out of your service pipeline, I am sure. Did we sit at the table for fifteen minutes before anyone even took our order? Yes. Did it take them another twenty five to bring us our drinks? Also yes. But like I said, leeway. Since I’m already slinging hate, I might as well take this opportunity to mention the acoustics, which are a crime against the fine art of architecting interior spaces. Maybe it’s the high ceilings, but every word of every patron echoes in this bar, and makes it very loud even when it is not particularly crowded. I wouldn’t take anyone here if I wanted to have a conversation with them. On the plus side, the hand soap in the bathroom contains rum. The food was mediocre. We ordered foie gras popcorn, and it was a staunch reminder as to why no one sautes liver and then tosses it with popcorn. The high fat content of the liver killed all the crispness of the popcorn, while imparting only the scarcest flavor of foie gras. The hummus platter, though beautifully plated, was nothing I couldn’t get from Trader Joe’s. The carpaccio was adequate, however. Delicious and reasonably portioned for the price. Over all, if you’re downtown, stick to the Mistral Kitchen or the Zig Zag Cafe. If you’re not tied to a particular locale within Seattle, may I recommend the Canon. 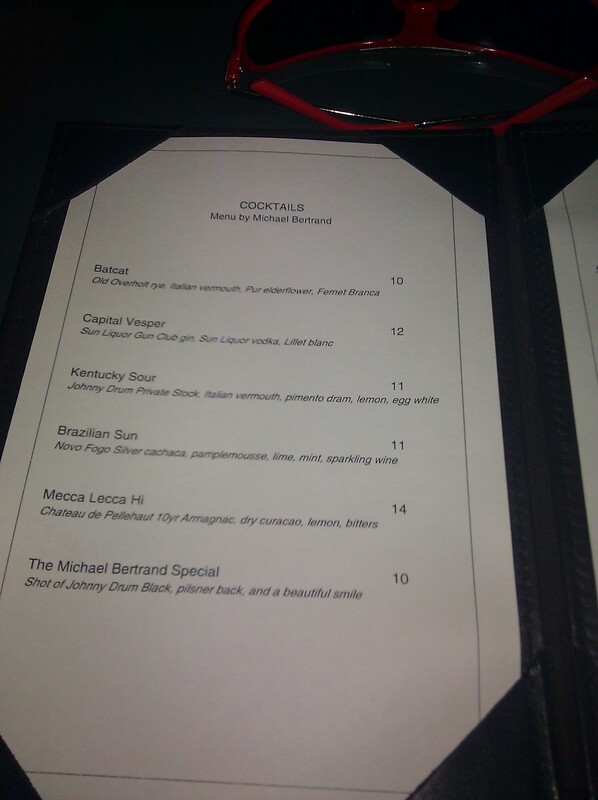 It is clearly at the top of the craft bartending game in Seattle right now. 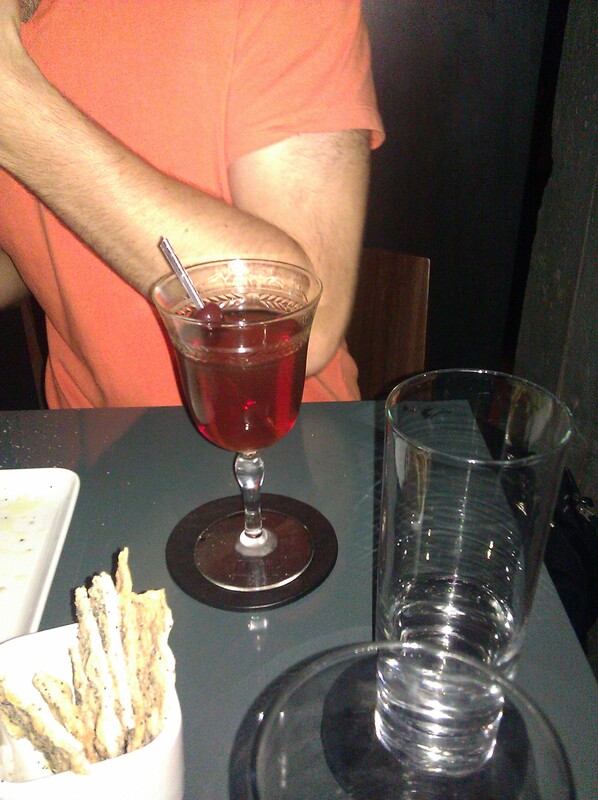 Categories: excursions | Tags: alcohol, bars, bartending, batcat, benedictine, booze, cocktail, cocktails, drinking, drinks, elderflower, fernet, mixing, mixology, preakness, rye, seattle, vermouth, vessel, violette, violette fizz | Permalink.